I would never forget the day I arrived in Madrid. It was a Sunday, October 10, 2010, a Columbus Day weekend. I arrived on the super long weekend, when the Spanish people started their holiday on Thursday and did not go back to work until the following Wednesday. The long weekend was ridiculously long. Lisa and I just flew in from Lisbon (where I was just robbed and we almost didn’t get any plane tickets because it was ridiculously expensive. But thanks to the extremely nice lady in Iberia Airline and my worried face, we eventually got on a plane for around 50-60 euro), and we took the metro to the heart of the city: Puerta del Sol. We, senselessly, did not make any reservation in any hostel. Our couch surf requests were declined and we did not find many girls who were available on those days. So, absentmindedly, we just thought that it was still gonna be easy to get a place to stay. Until we were circling around Puerta del Sol for a number of time and found out that (almost) all the hostels were fully booked. After walking for four hours (with all our luggages and backpacks), we found a ridiculously expensive hostel (I think it was 21 euro for one night), which was not what you could call clean. Being extremely tired and hopeless, we finally took the room. This first bad impression of Madrid, thankfully, did not stay long. The next day, we found an International Youth Hostel and we immediately dragged all of our luggages right away. The area where Lisa and I were staying was called Calle de Huertas. It was kind of easy to get lost around the area, because when I decided that one plaza would be a ‘clue’ to get back to our hostel, I found another plaza that looked very similar to the first one. But the area was pretty cool. Very youth-spirited. There were lots of bars and restaurants that were fairly cheap, or rather, affordable. The stores there were small, intimate, and rather funky. 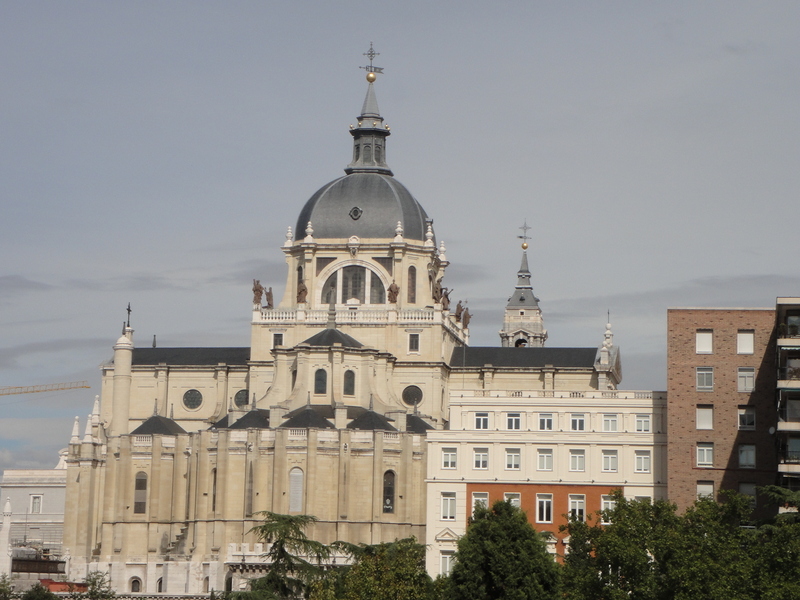 The coolest thing we did in Madrid was taking the free walking tour. Lisa and I did a similar free walking tour in Prague (well, it was not entirely free, it was a tip-based walking tour, meaning if you like the tour then you are encouraged to leave some tip, but you don’t, otherwise) and the Madrid one was a lot better, due to a cooler guide. We actually learned some unbelievable historical facts about Madrid that we wouldn’t have found out if we’re sightseeing only the two of us. 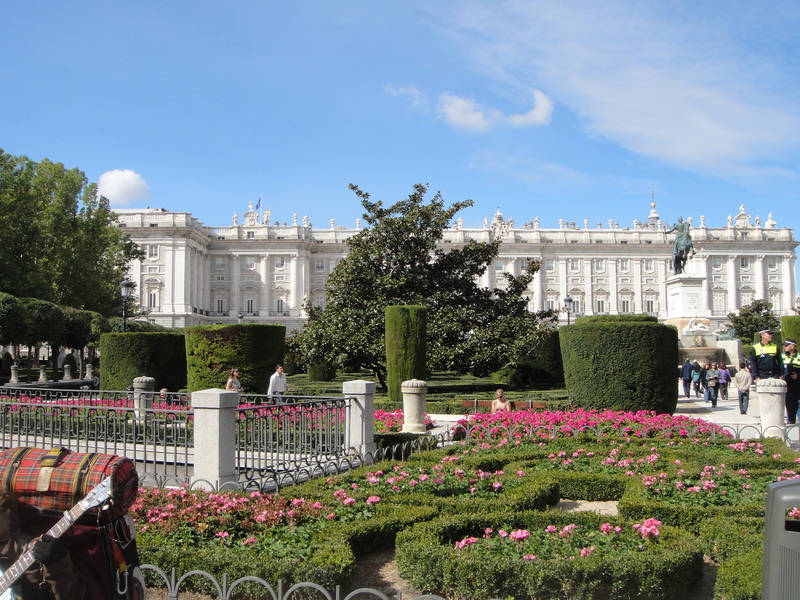 One of the first stops in this walking tour was, of course, The Royal Palace. I guess palaces would be the ‘most visited’ tourism sites all over the world. And in this particular palace, there is always a very long queue to get in. If you’re crazy about crystal decoration, you should really go and take a look at what’s inside the palace. My mom did this past June and she said it was almost felt like she died and woke up in heaven full of crystal. Right next to the palace was the Cathedral. The unique thing about this cathedral was the various point of view that depend on where you stand. It had the boring view of neoclassical (that’s the fascist look) style and it also had has the pretty vintage architectural look. Of course, the one I took picture of was the more prettier one. It was funny because this side of the Cathedral was meant to be hidden, so that its beauty would not override the beauty of the Royal Palace. Just off the street from the Royal Palace, there was a bridge with the most beautiful city overview. But if you click on the image to enlarge it, you can see a vague reflection street lights and building. This particular bridge (which name I forgot) was covered with glass due to it became Madridians’ favorite suicidal spot. 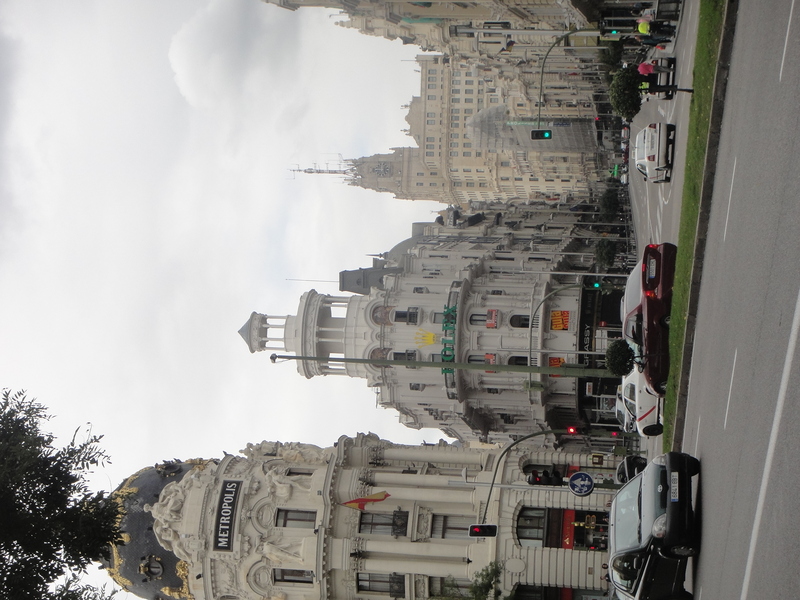 Several other things that I saw in Madrid were the glamorous buildings. 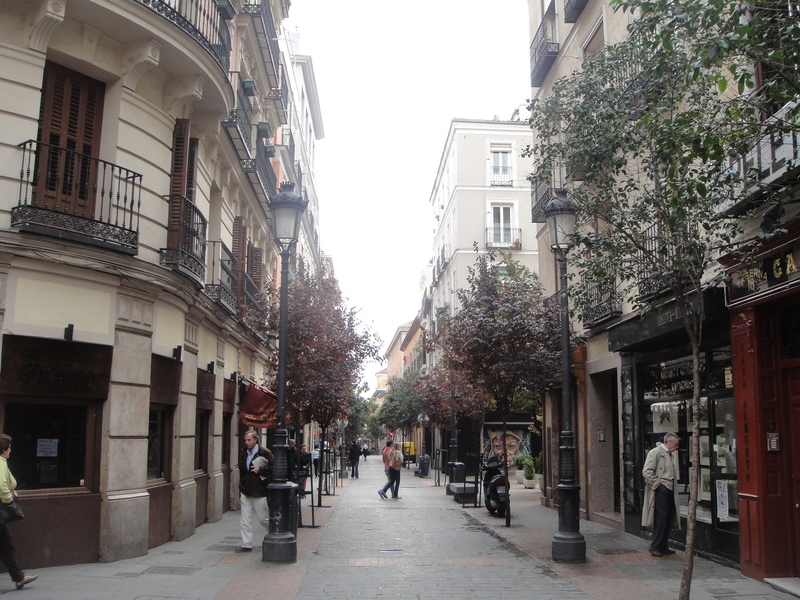 This one below was a very expensive and high-end area in Madrid. It was said that Ernest Hemingway, when he was in the lowest point of his depression, stayed in the building on the far left sometime before he died. That corner was also believed that its significance was once (a long time ago) equal to the current New York’s Times Square. This area below was also a very expensive area. Back in the day, the royal family member used to live there. Nowadays, the ridiculously rich people own one or two properties there. This particular building below quite distinct to the others around it, due to its rather bright color. This particular building was believed to be the oldest hotel in Madrid. It was built 400 years ago, or around that time. By the way, aside from the glamorous buildings and the beautiful spots in the capital, I noticed two things about Madridians. First, Madridians (or Spanish, rather) really like to party. I don’t know if it was because of the extremely long weekend, but I was walking around Puerta del Sol at midnight, and a lot of street performers were still performing, restaurants were still packed, and people were still out and about. I learned that Spanish people ate dinner at 11 pm and they really love their siesta. And I was a bit shock when I learned about this. Europe is really a diverse continent! Second, I noticed that Madridians were CRAZY about lottery. People did not mind standing in a 2 km line to but a lottery tickets. Coming from a country where gambling is (supposed to be) illegal, I was truly in shock. 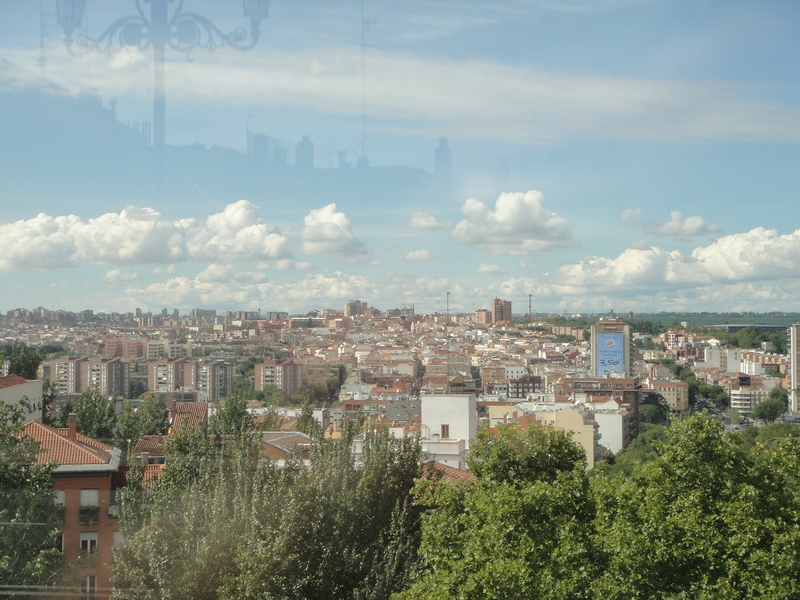 Well, in the end, my experience in Madrid was one of the most unforgettable ones. 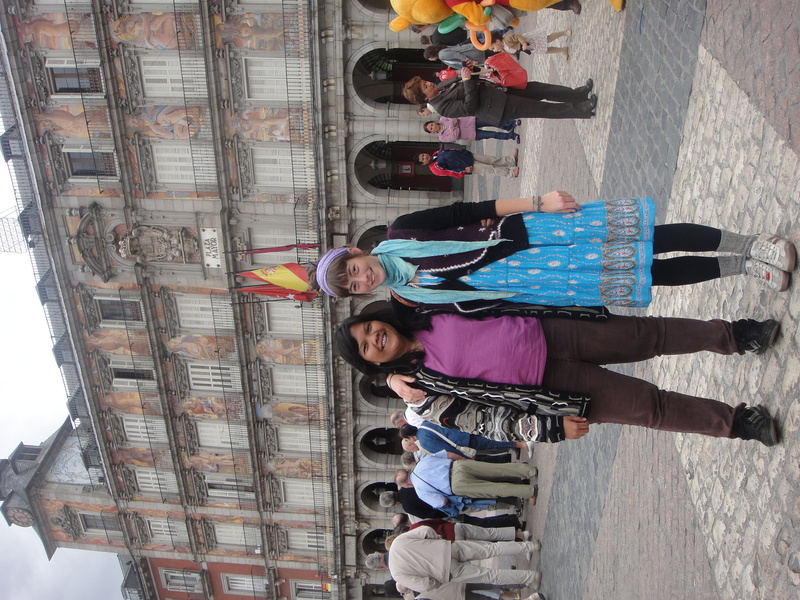 I am gonna leave with one last picture of Lisa and I in Madrid ‘must visit’ site: Plaza Mayor. 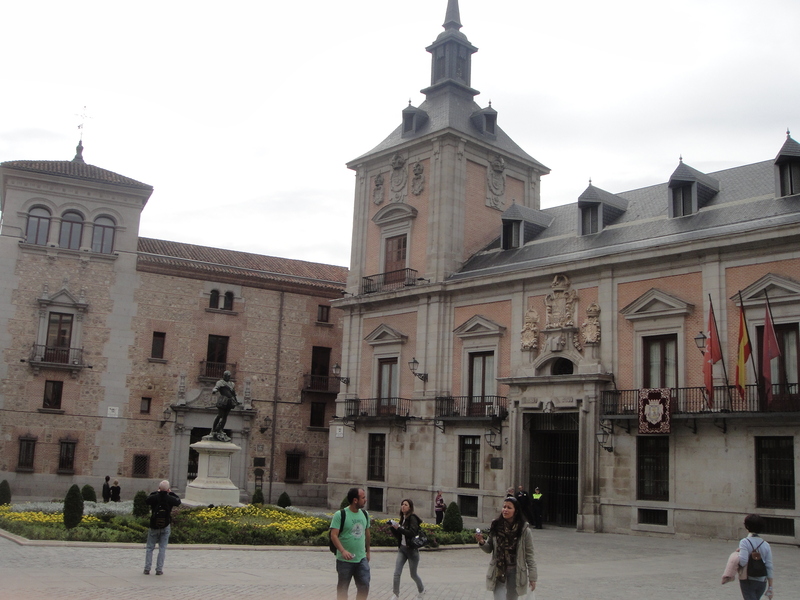 Plaza Mayor often played as the main meeting point for tourists. Thousands of souvenir shops, over-priced restaurants, and pickpockets were in business here. So, if you’re coming there, please do be careful. Of course you can notice the difference between Lisa and I.